For a cut that has as rich a history as it does a modern appreciation, you need not look further than the Marquise or Navette cut. 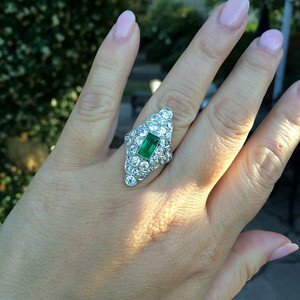 This stunning cut has a shape that is extremely unique when compared against its counterparts, and looks stunning in stones that extend beyond a diamond. The Marquise cut is a great choice for the historian and modernist alike. If you are considering a Marquise cut stone, it is essential to be well informed of the pros and cons that come with the cut, the most suitable GIA grades for the cut, and the most sensical settings for the cut. This article will walk you through the in’s and outs, as well as the in between, of the Marquise cut. The Marquise cut originally crafted in the 1700’s when King Louis XV employed a jeweler to create a cut that was reflective of the smile of his mistress, Jean Antionette Poisson, the Marchioness Madame de Pompadour. Since then, this style of cut has evolved in the versatile piece of art that it is today. You may hear some refer to the Marquise cut as the Navette cut, do not be misled as these are one and the same. This nickname has become popular as the word itself is an homage to the Navy and the cut has a particular resemblance to a little ship. The Marquise cut is extremely versatile in appearance and will compliment any style of ring and ring material – this is particularly pleasing to those that are in the market for unique rings but can’t find a fitting stone or cut. In terms of versatility, the Marquise cut is also stunning in gemstones of all types, specifically due to its inherent brilliance and the shallowness of the cut itself. 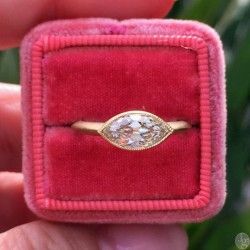 The Marquise cut is a shallow cut that carries a majority of the stones cut towards the top of the ring, making its stone appear larger to the untrained eye than most equally sized stones. 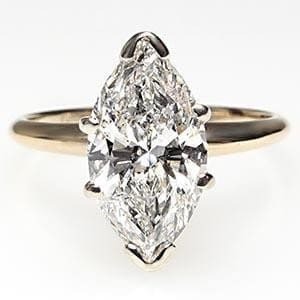 As much as it is shallow, the Marquise cut does not compromise its brilliance and, when compared against cuts of similar depth, it retains an impressive amount of fire and brilliance in its stone. The Marquise cut also has some complimentary features. First, the cut has an intrinsic ability to hide impurities and inclusions of the stones with which it is created, allowing for a larger set of stones that it can be cut out of. Second, this cut is very complimenting of the hand on which it is worn, bringing out the best features of every ring finger! The biggest complaint we have in terms of the Marquise cut is something called “The Bowtie” effect. The bowtie affects several cuts, including this one, the Oval cut, Pear cut and the Heart cut, and is the results of shadows creating a dark band around the center of the diamond in the shape of a bowtie. The bowtie effect, however, can be remedied by the quality of the stone used to create it. A good quality stone will be less likely to create the bowtie effect. The Marquise cut also requires special care in that it has delicate edges compared to those of some other cuts. This negative attribute can be combatted with proper attention to setting. An ideal diamond for a Marquise Cut will be anything from SI2 and up. Avoid Marquise cuts that fall into the categories of I1, I2 and I3. The ideal diamond for a Marquise cut is colorless, so grades D, E, or F – however a nearly colorless grading that’s closer to the completely colorless spectrum, such as G, H, and I will also produce desirable results. The ideal setting for a Marquise cut is a 6 prong setting. Like a 4 prong setting, this setting will allow natural sunlight to penetrate the cut’s stone and maximize the brilliance and fire of the cut. A 6-prong setting has two prongs on either side of the stone, one at the top and one at the bottom. The top and bottom prongs are in place to protect the delicate tips of the Marguise cut. Okay, so now we know that the Marquise cut and the Navette cut are the same thing and that these terms are used interchangeably. The ideal stone for this cut should be of S2 to Flawless Clarity and D-I in color, primarily due to the cuts forgiving properties. The Marquise cut is shallow which makes diamonds appear larger, but also has an impressive amount of brilliance and fire. The Marquise cut is also extremely versatile and looks great on essentially any gemstone. The ideal setting for the Marquise cut is the 6-prong setting due to its ability to protect the cuts sensitive tips. 1. If your Marquise cut stone is a diamond, deal only with reputable jewelers that will provide IGA certification.